Most of you would have seen some really horrifying motorcycle crashes. The crash video we have today, however, is slightly different from many other videos we’ve featured before. The video starts with the motorcycle rider excitedly talking about the time when he bought a brand-new Yamaha R1 superbike. The clip then goes on to show the enthusiasm of the R1-owner and his biking buddies. Towards the end of the video, the motorcyclist meets with a really high-speed accident. Luckily, however, the rider lives to tell the tale. Actually, the rider can be seen doing high speeds on a well-paved expressway with sparse traffic. While the video doesn’t show the exact speed of the motorcycle, the fact that the R1 was simply flying past most of the traffic hints at quite a high speed. All’s fine until the superbike approaches a corner. On watching the video carefully, you can see that the camera shook rather abruptly just a moment before the motorcycle enters the corner. Well, there are many answers to this. One can say that lady luck probably smiled on him and helped him recover from the crash. You can also say that the timely help of his friends saved him. However, one of the biggest reasons for his survival is his riding gear. Luckily, the rider was wearing riding overalls and what looks like a high-quality helmet. His riding gear must have played a great role in saving him from the life-threatening crash. While this crash happened a while ago, it’s only now that the rider has uploaded the footage online. He says that earlier he didn’t feel like sharing the footage. However, the various accounts of bikers who sustained serious injuries in accidents made him upload the footage. He goes on to say that he wants other riders to learn from his mistake. 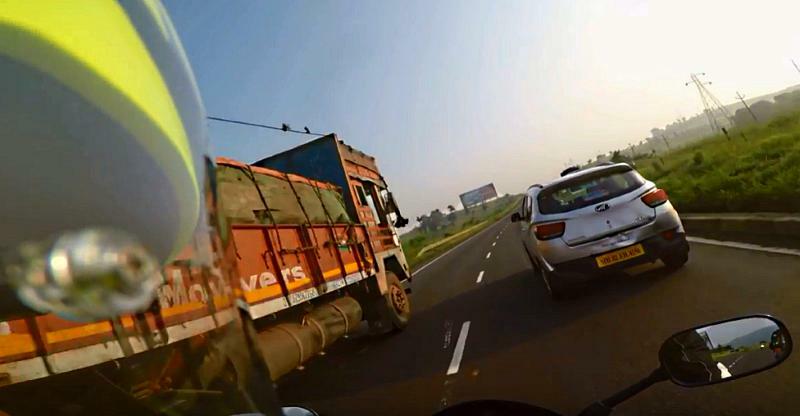 While the video is not too disturbing and doesn’t show blood and other gory details, it’s a pretty spine-chilling feeling to see someone crash at such a high speed.